Vinyl flooring has come a long way from the days when it was paper backed, had somewhat utilitarian patterns and was installed with an adhesive. Developments in the manufacture of vinyl flooring have transformed the appearance, functionality and affordability of the product, making it a desirable flooring option for your home. A durable and easy to clean flooring product, vinyl sheet flooring is available in a variety of high definition looks from natural stone and wood to patterned designs. In the past, the low maintenance characteristics of vinyl flooring made it an ideal product for kitchens and bathrooms but the quality of today’s product lends itself to any room in your home. 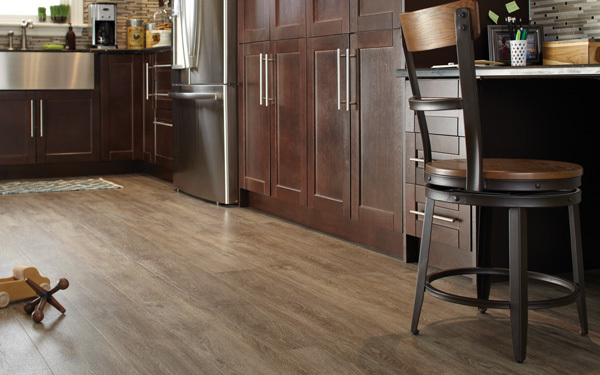 The three common formats of vinyl flooring are sheet, tile and plank; vinyl sheet offers a continuous flowing pattern while vinyl tiles have more of a checkerboard pattern and plank resembles the look of hardwood flooring. When choosing between the three, the most important consideration should be the look you want for your floor. Vinyl sheet is a large roll of vinyl flooring that can be either fibreglass-backed or paper-backed, each designed for different methods of installation. Paper-backed vinyl is one of the most common types of vinyl sheet and is installed with an adhesive; however, fibreglass-backed is a popular vinyl product because it uses little or no adhesive, making it more cost effective. You can also choose from different types of vinyl flooring, including wax, no-wax or gloss, surface textured and sunlight protective as well as the thickness, colour and design of the product. While vinyl sheet flooring offers you the look of ceramic tiles, vinyl tile has gone one step further to achieve the porcelain tile look and can be installed with or without acrylic grout that resists staining.